Related articles: St. Peter’s Basilica and Vatican City in Capricorn and Sagittarius, The Tempel of Zeus in Olympia, The Facebook Headquarters as another “Virtual City”, Capricorn and Sagittarius – The Giant Crystals of Naica, Pluto`s Gate in astrogeography. The Forbidden City is the Imperial Palace in Beijing. It was built from 1406 until 1420 by Yongle the Third – Emperor of the Ming dynasty born on 2 May 1360. Almost the entire area of the Forbidden City is located in the constellation of the fire sign Sagittarius with the earth sign Capricorn. This applies to morphogenetic radius/field level 3, which shows how the place is embedded in the surrounding area. Exactly the same constellation is also valid for Vatican City and St. Peter`s Basilica in Rome which explains the exclusive character and also the durability of such institutions. Compare also The Tempel of Zeus in Olympia and the Facebook Headquarters as another “Virtual City”in the same constellation. Highly defensive, conservative, hierarchical, strict Capricorn stands for the character of a stronghold and for all government institutions that deal with administration, legislation, law and the exercise of power. Capricorn is the to be seen as the indicator for the exclusive and strictly forbidden character of the Forbidden City, as a place that could never be reached by normal people. And Capricorn also stands for the ideal of perfection of form and of the “hierarchy of the absolute”. The constellation of Capricorn with Sagittarius can be seen here as an astrological equivalent of high educated social classes, science and priest castes and as describing an atmosphere dominated by formal regulations, civil servants and the arrangements and requirements of court etiquette. For field level 1 which describes the supraregional, national as well as international significance of the capital Beijing is located in the combination of centralistic, royal fire sign Leo which second only to Libra is the most important indicator for chinese culture with highly expansive Sagittarius which can be observed as a central indicator for the Forbidden City at the same time. 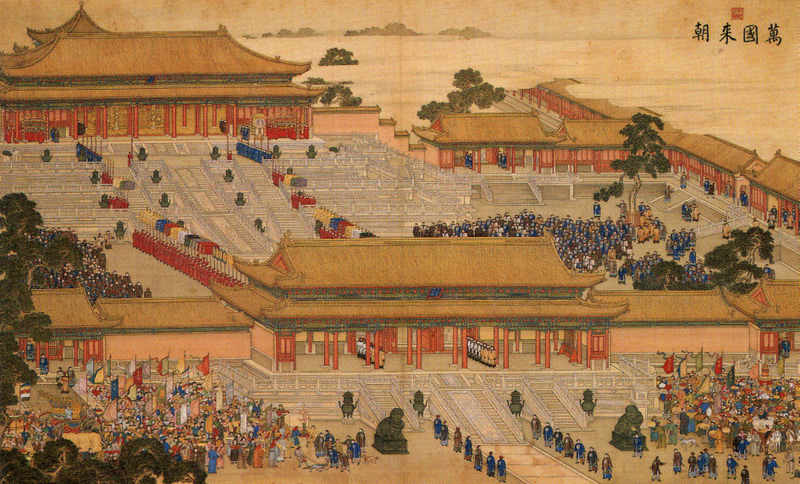 Court audience given by Emperor Qianlong, Forbidden City, Hall of Supreme Harmony. The “Hall of Supreme Harmony” is the central building in the Forbidden City. For astrogeography level 4, which is indicative of the significance of the Hall of Supreme Harmony within the Forbidden City the constellation is in dynamic fire sign Sagittarius with earth sign Taurus. Taurus the principle of food production and market places in combination with Sagittarius the sign of harems and the strife for luxury and abundance defines the term “Perfect Harmony” as being in a situation of food abundance, wealth and the security of supply.